Welcome to lesson 4 ‘Service Level Management’ of the ITIL Intermediate SOA tutorial, which is a part of the ITIL Intermediate SOA Foundation Certification course. This Learning Unit introduces the service level management (SLM) process and how it contributes to SOA. Understand the complete overview of the objectives, scope and the importance of SLM as a process to generate business value. Explain the IT SLM policies, principles, concepts, activities, methods, and techniques about SOA practices, including SLA structures and determining service level requirements. Review the efficient use of SLM metrics along with monitoring of service performance against SLAs (as well as OLAs). SLM is a vital process for every IT service provider organization in that it is responsible for agreeing and documenting service level targets and responsibilities within SLAs and service level requirements (SLRs) for every service and related activity within IT. If these targets are appropriate and accurately reflect the requirements of the business, then the service delivered by the service providers will align with business requirements and meet the expectations of the customers and users regarding service quality. If the targets are not aligned with business needs, then service provider activities and service levels will not be aligned with business expectations and problems will develop. The SLA is effectively a level of assurance or warranty about the level of service quality delivered by the service provider for each of the services delivered to the business. The success of SLM is very dependent on the quality of the service portfolio and the service catalog and their contents because they provide the necessary information on the services to be managed within the SLM process. Let us discuss the Objectives of Service Level Management In the next section. The purpose of the SLM process is to ensure that all current and planned IT services are delivered to agreed achievable targets. This is accomplished through a constant cycle of negotiating, agreeing, monitoring, reporting on and reviewing IT service targets and achievements, and through the instigation of actions to correct or improve the level of service delivered. In the next section, we will understand the Scope of Service Level Management as well as what should and should not include in SLM process. SLM should provide a point of regular contact and communication to the customers and business managers of an organization about service levels. In this context, it should represent the IT service provider to the business, and the business to the IT service provider. This activity should encompass both the use of existing services and the potential future requirements for new or changed services. SLM needs to manage the expectation and perception of the business, customers, and users and ensure that the quality (warranty) of service delivered by the service provider is matched to those expectations and needs. To do this effectively, SLM should establish and maintain SLAs for all current live services and manage the level of service provided to meet the targets and quality measurements contained within the SLAs. SLM should also produce and agree on SLRs for all planned new or changed services that document warranty requirements. This will enable SLM to ensure that all the services and components are designed and delivered to meet their targets regarding business needs. Instigating and coordinating SIPs for the management, planning, and implementation of service and process improvements. Negotiation and agreement of requirements for service functionality (utility), except to the degree functionality influence a service level requirement or target. SLAs typically describe key elements of the service’s utility as part of the service description, but SLM activity does not include agreeing what the utility will be. Detailed attention to the activities is necessary to deliver service levels that are accounted for in other processes such as availability management and capacity management. Negotiation of underpinning supplier contracts and agreements. This is part of the supplier management process to which SLM provides critical input and consultation. Let us now discuss what Service Level Management provides to the business. SLM provides a consistent interface to the business for all service-level-related issues. It provides the business with the agreed service targets and the required management information to ensure that those targets have been met. Where targets are breached, SLM provides feedback on the cause of the breach and details of the actions taken to prevent the breach from recurring. Thus SLM provides a reliable communication channel and a trusted relationship with the appropriate customers and business representatives at a tactical level. Let us learn what the main activities within the SLM process should include. Providing appropriate management information to aid performance management and demonstrating service achievement. Let us now discuss the triggers as well as the process inputs and outputs of the service Level management process, in the next section. Changes in strategy or policy. Other inputs: including advice, information, and input from any of the other processes (e.g., incident management, capacity management, and availability management), together with the existing SLAs, SLRs and OLAs and past service reports on the quality of service delivered. Revised requirements for underpinning contracts: changes to SLAs or new SLRs may require existing underpinning contracts to be changed, or new contracts to be negotiated and agreed. Let us now understand what the most critical interfaces for the SLM process are. 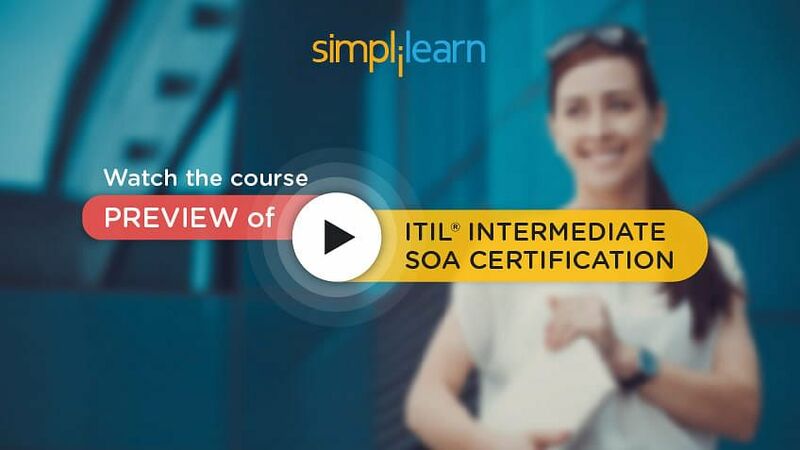 Looking to learn more about ITIL Intermediate SOA? Why not enroll for our Course! Before proceeding to learn about the interfaces of the SLM, let us look at the following diagram to understand the SLM process. 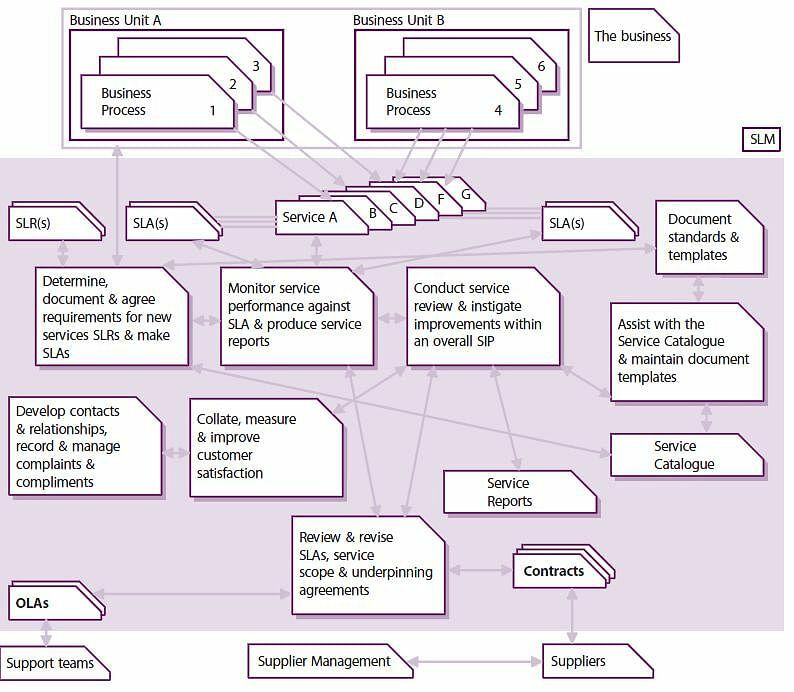 This Diagram shows the relationship between the business and its processes and the services, and the associated technology, supporting services, teams, and suppliers required to meet their needs. It demonstrates how important the SLAs, OLAs, and contracts are in defining and achieving the level of service required by the business. Now let us understand the interfaces in the next section. Business relationship management - This process ensures that the service provider has a full understanding of the needs and priorities of the business and that customers are appropriately involved/represented in the work of service level management. Service catalog management - This process provides accurate information about services and their interfaces and dependencies to support determining the SLA framework, identifying customers/business units that need to be engaged by SLM and to assist SLM in communicating with customers regarding services provided. Incident management - This process provides critical data to SLM to demonstrate performance against many SLA targets, as well as operating with the fulfillment of SLA targets as a CSF. SLM negotiates support-related targets such as target restoration times, and then the fulfillment of those targets is embedded into the operation of the incident management process. Supplier management - This process works collaboratively with SLM to define, negotiate, document and agree on terms of service with suppliers to support the achievement of commitments made by the service provider in SLAs. Supplier management also manages the performance of suppliers and contracts against these terms of service to ensure related SLA targets are met. Availability, capacity, IT service continuity and information security management - These processes contribute to SLM by helping to define service level targets that relate to their area of responsibility and to validate that the targets are realistic. Once targets are agreed, the day-to-day operation of each process ensures achievements match targets. Financial management for IT services - This process works with SLM to validate the predicted cost of delivering the service levels required by the customer to inform their decision-making process and to ensure that actual costs are compared with predicted costs as part of the overall management of the cost-effectiveness of the service. Design coordination - During the service design stage, this process is responsible for ensuring that the overall service design activities are completed successfully. SLM plays a critical role in this through the development of agreed SLRs and the associated service targets which the new or changed service must be designed to achieve. Let us now learn what Service Level Agreements are and how many types of agreements exist in SLA. Using the service catalog as an aid, SLM must design the most appropriate SLA structure to ensure that all services and all customers are covered in a manner best suited to the organization’s needs. There are some potential options, including the following. Service-based SLA – This is where an SLA covers one service, for all the customers of that service – for example, an SLA may be established for an organization’s email service, covering all the customers of that service. This may appear fairly straightforward. However, difficulties may arise if the specific requirements of different customers vary for the same service, or if characteristics of the infrastructure mean that different service levels are inevitable (e.g., head office staff may be connected via a high-speed LAN, while local offices may have to use a lower-speed WAN line). In such cases, separate targets may be needed within the one agreement. Difficulties may also arise in determining who should be the signatories to such an agreement. However, where basic levels of service are provided across all areas of the business (for example, email or telephony), the service-based SLA can be an efficient approach to use. Multiple classes of service (for example, gold, silver, and bronze) can also be used to increase the effectiveness of service-based SLAs. Customer-based SLA This is an agreement with an individual customer group, covering all the services they use. For example, agreements may be reached with an organization’s finance department covering, say, the finance system, the accounting system, the payroll system, the billing system, the procurement. Customers often prefer such an agreement, as all of their requirements are covered in a single document. Only one signatory is normally required, which simplifies this issue. Multi-level SLAs Some organizations have chosen to adopt a multi-level SLA structure. Corporate level - This will cover all the generic SLM issues appropriate to every customer throughout the organization. These issues are likely to be less volatile, so updates are less frequently required. Customer level - This will cover all SLM issues relevant to the particular customer group or business unit, regardless of the service being used. Service level - This will cover all SLM issues relevant to the specific service, about a specific customer group (one for each service covered by the SLA). The SLM process starts with the list of business service definitions that come from the service catalog process. The next step is determining and documenting the exact quality requirements from the customer for existing and new services to produce SLRs. Based on this input, SLM has to design the best possible SLA, so that all services can be provided and clients can be serviced in a manner that meets mutual needs. To ease this process, typically the service provider introduces various forms, questionnaires, checklists, and document standards (SLR and SLA templates). These form the SLA framework to make the process more efficient and repeatable. Often SLA categories are introduced as well, to offer one and the same service in different qualities and cost (i.e., Gold, Silver, and Bronze). This allows for further standardization of services and formalization of the process. Lastly, reviews and improvement initiations must be carried out within overall SIP and logging and management of all complaints and compliments is very essential. In the next section, let us understand information management for SLM process. It provides the information and trends on customer satisfaction, including complaints and compliments. SLM is crucial in providing information on – the quality of IT service provided to the customer, and – information on the customer’s expectation and perception of that quality of service. Let us now move on to learn about the Critical success factors (CSF) and Key performance indicators (KPI) in the next two sections. The following list includes some sample CSFs for SLM. Each organization should identify appropriate CSFs based on its objectives for the process. Each sample CSF is followed by a small number of typical KPIs that support the CSF. These KPIs should not be adopted without careful consideration. Percentage reduction in SLA breaches caused because of internal OLAs. Deliver the service as previously agreed at affordable costs. Percentage increase in the speed and of developing and agreeing on appropriate SLAs, KPI Frequency of service review meetings. One challenge faced by SLM is that of identifying suitable customer representatives with whom to negotiate. Who ‘owns’ the service on the customer side? In some cases, this may be obvious, and a single customer manager is willing to act as the signatory to the agreement. In other cases, it may take quite a bit of negotiating or cajoling to find a representative ‘volunteer’ (beware that volunteers often want to express their own personal view rather than represent a general consensus), or it may be necessary to get all customers to sign. If customer representatives exist who are able genuinely to represent the views of the customer community, because they frequently meet with a wide selection of customers, this is ideal. Unfortunately, all too often representatives are head-office based and seldom come into contact with genuine service customers. In the worst case, the service level manager may have to perform their own programme of discussions and meetings with customers to ensure true requirements are identified. Another challenge may arise if there has been no previous experience of SLM. In these cases, it is advisable to start with a draft SLA. A decision should be made on which service or customers are to be used for the draft. It is helpful if the selected customer is enthusiastic and wishes to participate – perhaps because they are anxious to see improvements in service quality. The results of an initial customer perception survey may give pointers to a suitable initial draft SLA. One difficulty sometimes encountered is that staff at different levels within the customer community may have different objectives and perceptions. For example, a senior manager may rarely use a service and may be more interested in issues such as value for money and output, whereas a junior member of staff may use the service throughout the day, and maybe more interested in issues such as responsiveness, usability, and reliability. It is important that all of the appropriate and relevant business requirements, at all levels, are identified and incorporated in SLAs. Some organizations use focus groups from different levels from within the customer community to help ensure that all issues have been correctly addressed. This takes additional resources but can be well worth the effort. The other group of people that has to be consulted during the whole of this process is the appropriate representatives from within the IT provider side (whether internal or from an external supplier or partner). They need to agree that targets are realistic, achievable and affordable. If they are not, further negotiations are needed until a compromise acceptable to all parties is agreed. The views of suppliers should also be sought, and any contractual implications should be taken into account during the negotiation stages. Where no past monitored data is available, it is advisable to leave the agreement in draft format for an initial period, until monitoring can confirm that initial targets are achievable. Targets may have to be re-negotiated in some cases. Many organizations negotiate an agreed timeframe for IT to negotiate and create a baseline for establishing realistic service targets. When targets and timeframes have been confirmed, the SLAs must be signed. Once the initial SLA has been completed, and any early difficulties overcome, then move on and gradually introduce SLAs for other services/customers. If it is decided from the outset to go for a multi-level structure, it is likely that the corporate-level issues have to be covered for all customers at the time of the initial SLA. It is also worth trialing the corporate issues during this initial phase. Let us discuss some of the risks associated with service level management in the next section. Poor and inappropriate communication is achieved with the business and customers. This includes, what is in scope and out of the scope of the agreement? This section contains the description of hours of service availability like 24\7 service or only weekdays etc. This section encompasses the targets for the provision of the support service and the reporting and reviewing processes and frequency. This includes the target availability levels within the agreed services hour which is normally expressed in percentages (e.g.99.5%). This encompasses the maximum breaks that can be tolerated within an agreed period. This section may incorporate a brief mention of the organization’s service continuity plans together with details of how the SLA might be affected, should a disaster situation occur. Describing of the organization’s security policies covering issues such as password controls, security violations, unauthorized software usage, etc. This section may include the details of how to contact Service desk, what to do outside the support hours, details of incident response targets, Service Level targets, response and resolution time, incident impact and priority codes, classification of incidents, etc. This may contain the details of the contact within each of the parties and escalation processes and escalation matrix etc. Responsibilities of the various parties like the service provider, customer and the users involved in the service. This includes details of commercials involved in the provision of services, charging policies, charging periods, invoicing procedures and payment conditions, etc. Next, let’s discuss the sample content of OLA. Planning to get ITIL Intermediate SOA Certified? Click to see our Course Preview! This section may contain comprehensive explanation and details of the support service being provided. Covers the scope of the agreement and what is excluded. Include the description of the hours for which the support service is provided. Section encompasses the targets for the provision of the support service and the reporting and reviewing processes and frequency. May contain the details of the contact within each of the parties and escalation processes and escalation matrix. The responsibilities and targets agreed for implementation of various ITSM processes like Incident Management, Problem Management, Release Management, Service Asset and configuration management, Information security management, Availability management, etc. With this, we have come to the end of this learning unit. This lesson gave you a clear idea of the Service Level Management process along with its principles, concepts, activities methods, and techniques. Similarly, the next lesson focuses on Demand Management.